Mastering a blow dry to get the best from your do for days. In December it seems like it’s party after party which can take it’s toll on our hair. How can we possibly create so many looks without over-washing and over-styling? It seems it’s an impossible feat. Or is it? When it comes to making your hair last the season, we find it’s all in the prep. 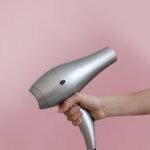 Without further ado, here is our top tips and how to guide to master the at home blow-dry and the products to get you through the season. Wash– you want a shampoo that is conditioning without making your hair so limp that you’re limited in your style options. Introducing TIGI Dumb Blonde Shampoo and Conditioner. Like all TIGI products (which we’re massively fond of) they smell incredible and the Dumb Blonde collection thoroughly cleanses your hair but we find that it leaves the hair with a bit of flexibility afterwards. If you’ve left the washing for a few days, shampoo twice and when applying conditioner focus on the ends of your hair and be stringent with the amount of conditioner you apply to your scalp as it’ll be tricker to create volume later otherwise. Prep– Don’t just use styling products on your hair when it’s damp- use a mix of protective and styling to get the best of both. Scrunch your hair with a towel rather than rub to remove some of the moisture- rubbing is just asking for split ends and troublesome knots. Apply Aveda Damage Remedy to damp hair and comb through- this is your protective element which will allow you to comb through your hair knot-free, it’s also highly moisturising and has a built in heat protector. For volume, add 2-3 pumps of Percy and Reed Smooth, Sealed & Sensational Volumising No Oil Oil and work through the roots and mid sections of the hair. Blow Dry– without any styling tools blow-dry your hair roughly to about 80% in all directions, using your fingers. For more volume, blow-dry hair upwards or tip your head upside down. It’s a hair stylist’s trick in creating more volume (something to do with the moving the hair follicle away from the way it grows). Blow Dry with style– once 80% dry, use a ceramic round barrel brush to create further volume. Do this by separating the hair into sections and focus on each section until you reach the top of your head- I usually split the hair in three sections with sectioning clips; bottom, middle then top of the head. Like with the rough blow-dry, lifting the follicle of the hair up with the brush will create more volume. Once you’ve worked on the lift, smooth the brush down the hair follicle to create a smooth look. Set– to set the style, using S Factor Vivacious Volume hairspray spray the hair whilst using the hairdryer on a cool temperature (go as cool as possible). Hold– To give the hair more hold and an extra boost, use TIGI Oh Bee Hive Dry Shampoo through the hair’s parting. 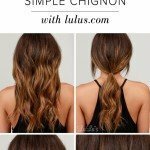 This also gives the hair some texture to work with if you want to style later in the day or even the days following. Dry shampoo offers long lasting hold, refreshes the hair, a base for styling and extra volume- for this, lift the section of the hair around the parting and spray, relax the hair down and rub your fingertips through your hair. Finish– Smooth the ends of the hair with Aveda Dry Remedy Oil which will keep the ends hydrated and the hair follicle smooth without looking or feeling greasy. Next week we’ll take a look at styles you can create with day old hair and creating looks to go from office to party.